Pride in the Plaza will be held July 9 from noon to 5:30 p.m. at Mission Plaza in SLO. This free event will feature live tribute performances to '80s pop, ABBA, and Lady Gaga. The Pride Drag Show, hosted by SLO's own Tommi Rose, will run July 7 at 6:30 and again at 8:30 p.m. at the SLO Guild Hall. Tickets are $20. Visit slopride.com for information on more Central Coast Pride events. It wasn't something he planned on doing, but, nonetheless, when he got the call, he responded swiftly. That call would lead to a future that included hosting the 2017 SLO Pride in the Plaza in a bubblegum pink wig and glitter-covered high heels. CJ Gormley remembers sitting at Luna Red in San Luis Obispo a few years ago with friends when a Cal Poly theater professor called asking if he would act in a cabaret show, before also asking how he'd feel about being in drag. "I'd never done it before, I wasn't quite sure what to expect," Gormley said. "But I told her, 'Sure, I'm down for anything.'" As a gay man, Gormley knew about drag, but it was never a world he'd stepped into before. That 2014 show where he acted as hostess of the cabaret (who was obsessed with smelling Hostess brand sweets) was a lot harder than Gormley expected, from taking a good hour and a half to put on his makeup to making sure his costume was altered just so. FIERCE CJ Gormley in character as his alter ego Rosé Aldé, will host Pride in the Plaza in July. "It's definitely not something to put down," Gormley said. "You're kind of making yourself out to be an exaggeration of your inner self." After graduating that same year with a degree in theater, Gormley picked up and moved to Las Vegas where he worked in event planning. While he still dabbled in drag here and there, it wasn't until his recent return to SLO that his alter ego drag queen was fully fleshed out. 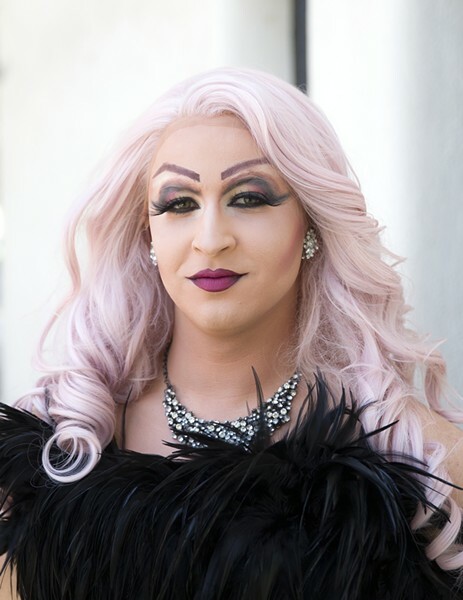 After moving back and getting involved as the treasurer of the Gay and Lesbian Alliance (GALA) alongside his boyfriend, Ryan Duclos, who serves as the president, Gormley agreed to host the Miss Central Coast Pride Pageant, featuring drag queens from across the county, in April. He decided he needed to develop a definitive character. He wanted to keep the pink hair as part of his signature look, and he wanted his name to have something to do with wine since he now worked at Edna Valley Vineyard. "I couldn't think of anything, and then I wondered if I could do something with Rosé," Gormley said. "I just thought it was fun." And just like that, the sassy, glamorous Rosé Aldé was born. After the pageant at Tooth and Nail Winery sold out, Gormley was asked by the Pride Committee to host Pride in the Plaza in July. GLITZ AND GLAM The transformation from CJ Gormley to Rosé Aldé includes sparkly high heels, a bright pink wig, more than an hour of putting on makeup, and the perfect little black dress. "Being asked to host Pride wasn't on the forecast for me, but I'm extremely excited to take that on," Gormley said. Aside from hosting the main event of the Pride weekend, Gormley will also be in character as Rosé Aldé at the after-party at Novo, which wraps up the festivities. While SLO may have a smaller LGBTQ scene than cities like San Francisco and LA, Gormley is quick to point out that the popularity of drag is increasing locally, with regular shows starting to pop up again at places like Metro Brewing and SLO Brew. The Pride celebrations this year will also include two drag shows featuring several reality TV stars from RuPaul's Drag Race. Gormley has celebrated Pride in Las Vegas, San Francisco, Salt Lake City, and even London, but this will be his first time celebrating Pride in its entirety in SLO. While SLO County is a place made up of small towns that run the spectrum of red and blue, Gormley knows that the sense of support for people in the LGBTQ community is still strong here. Ryah Cooley is here for the rosé and the frosé at rcooley@newtimesslo.com.